Angela Sterritt is an award-winning Gitxsan journalist, artist and writer, from British Columbia. Sterritt has worked as a journalist for close to twenty years and has been with CBC since 2003. Her reports have appeared in the Globe and Mail, The National, CBC’s The Current, and various other national and local news programs. She tells us about the importance of compelling storytelling through people’s experience. What is the most rewarding aspect of your work as a journalist? Being able to bring an in-depth or investigative story to listeners, viewers or readers to provide insights that provoke thoughtful reflection. For example, one of the hardest but most important of stories I worked on this year was covering the inquest into the death of a man in solitary confinement in a Canadian prison. Speaking to his parents, the guards and to human rights advocates, I was able to bring our audience into his cell, his life before and during solitary, and his final days before death. I was told very early on in my career that the most rewarding part of our job is creating change, be it legislative, policy or human. Months after my story was published, I read that the Ontario government was looking into the length of time prisoners were kept in solitary. Another reward of my job is having the tools to tell a robust and accurate story that illustrates the multiple dimensions of Indigenous communities. Too often in news stories, Indigenous people’s lives are wrought with tropes and stereotypes, which creates an inaccurate picture of who Indigenous people are. For example, sharing the complex and delicate stories of missing and murdered Indigenous women very early on in my career, I was able shed light on the strife of family members to be heard and the challenges they faced. Today, one of the highlights of my career remains when I reporting on Indigenous people’s relationship to the oilsands. My series showcased a reality that there are not just two sides of Indigenous people – those who want industry and those who fight against it, but like all humans, Indigenous people live within complex realities. Mainly to share news stories. When I am in the news reporter pool, I’ll share updates of the story I am working on that day (or hour). I’ll send video highlights or live tweet a press conference for example, post interview clips if I am out in the field or share still shots of a scene I am on. I once live tweeted an entire Shell Oil tour the company gave us, that allowed us exclusive access to the expansion of their Jackpine Mine and reclamation efforts they were working on. It was a decision my cameraperson was not a fan of but it was something that gave thousands of people instant access to an area of Canada that is often closed to the public. When I am working on a long-form investigative story, I may share elements of my story on social media that are, for the most part, already part of public discourse. For example, I recently spent about 50 hours driving along the Highway of Tears, and tweeted some of the compelling billboards of missing women, red dresses that were hung along the highway and provided updates or reminders on specific cases. It depends on the shift but if I am on a morning shift, a producer will generally provide an assignment. Earlier on in my career, journalists would be encouraged to pitch news stories a lot more than is done today. I will start making calls (anywhere from 2-40) and depending on where the story is going, I will be assigned to do a TV, radio and digital story. I will then head out in the field with a camera. When in the felid I will tweet, chase guests, conduct interviews, and let the cameraperson know what b-roll I am looking for. If the story is time sensitive, a writer will start a story for our online platform that we can update throughout the day, with pictures, quotes and videos that I gather. Usually I will file radio hits for the morning or the noon news, and by then will have tweeted various aspects of my story. If network TV or radio producers want news hits, I will do them on scene. For local news, I will normally package a rant or pak that will be edited in house, unless we are in a remote location and need to edit in the field. Depending on the shift and the story, TV news may request a live hit from the scene. Current affairs programs may also ask for an in-studio Q and A, to give depth to the story I am working on. I often do syndication or network hits for multiple regions in Canada for big news stories. This means doing several (I once did 17) hits throughout the day (This would normally be a day on it’s own, not on top of local assignments). Late night TV hosts or producers often request a rant or pak, and generally that is the last thing I do before I leave that day/night. What is the main message you want to convey through your work as an artist? That Indigenous people are not just all buckskin and arrows, and all doom and gloom, but that we have vibrant, complex and sophisticated stories of modernity and history to tell. I hope people connect to the people in my paintings, see themselves and create their own interpretations, ones that are filled with hope, enlightenment, kindness and empowerment but ones that are not afraid to peel back the layers of the darker sides of truth too. What advice do you have for PR people wishing to connect with you? 1. Come to me with a compelling personal story. This is key. I get 5-15 messages a day, with people wanting me to tell their story, but if there is no person or people in the story who are able to go on camera, radio and be quoted for an online story, there is no story. 2. Have a game plan. Share a succinct — short but well thought out and written story idea that explains why our audience will care about it. Have a fantastic, candid, thoughtful guest or guests ready to go — before the press release or call comes to me, who is or are comfortable with speaking on TV and radio. Explain the visuals that you have, that we can tape or that you can supply, and provide great quotes. 3. Follow up, share your thoughts of the story I did, and your excitement about future stories. Twitter! Then CBC, Globe and Mail, New York Times. In that order, on most days. Coffee. And always need more. 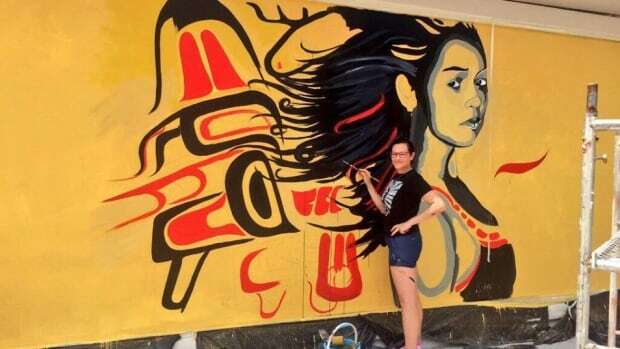 A Gitxsan artist from British Columbia is among several artists from around the world chosen to create murals at a mountain village resort in China. “To be able to put Gitxsan people on the map and shed light on the reality and history of Indigenous people in Canada is something I am very grateful for,” Sterritt said. Angela Sterritt, who is also an award-winning journalist, spent five days painting her mural on a 10-seven-foot wall in a resort on Mount Longhu in Jiangxi, a province in southeast China. She travelled to China at the invitation of Karl Schutz, a German-born Vancouver man known for establishing an acclaimed series of murals in Chemainus, B.C., in the 1980s. 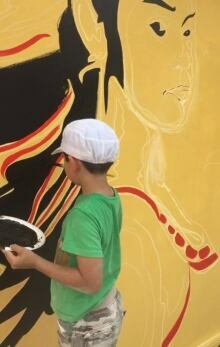 Schutz, in turn, was invited to organize the mural project by Steven Liu, a well-known Chinese entertainer, who “wanted to create a global mural attraction in his artisan village,” according to Schutz. “I found Angela’s website on line and was amazed about her powerful art … her painting is awe inspiring,” said Schutz. Sterritt made the journey with her young son, Namawan, who also helped with the project. The mural Sterritt painted is a re-creation of one of her existing works, called First Contact, which she says is about the resilience and strength of Indigenous women. It is a striking image is of an Indigenous woman facing the viewer, while helicopters hover behind. “It depicts a woman whose connection and love for her community, family, the land and her culture eclipse fear instilled in us at the time of first contact,” Sterritt said. Sterritt describes the experience of being in a mountain resort in China as “nothing short of incredible,” especially the food and the beautiful scenery. It wasn’t without challenges, however. “We also were faced with very, very hot weather, peaking at about 38 degrees daily, so often it was too dangerous to work. There were also several thunder storms, which meant less time to work as the heavy rain and wind would wash fresh paint or chalk away,” Sterritt said. Working through a Chinese translator was challenge, she said. Also she injured her feet while climbing down from a scaffold and in the heat, the wounds soon became infected. Still, Sterritt said the overall experience of sharing her work, providing an image of contemporary Indigenous peoples without stereotypes, and the story of missing and murdered Indigenous women and girls made everything worth it. What Makes A Man Panel Discussion Friday, February 19th, 2016 featuring Cat Criger, Lyndia Jones, and Gladys Radek. Moderated by Angela Sterritt. 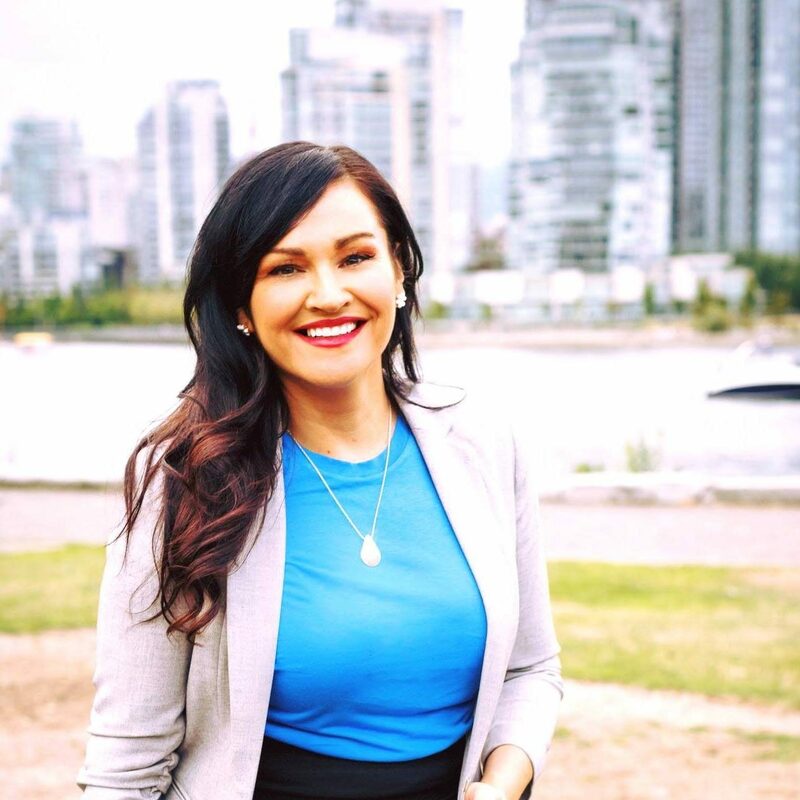 Angela Sterritt is an award-winning Gitxsan journalist, artist and writer from British Columbia who is currently a television, radio and digital reporter with the Canadian Broadcast Corporation (CBC). Sterritt has worked as a journalist for close to fifteen years and has been with CBC since 2003. Sterritt was recently awarded a prestigious William Southam Journalism Fellowship at Massey College in Toronto and is the first Aboriginal person to ever receive the award since its inception in 1962. In addition to her book on MMIWG2S, Sterritt is also currently working on a CBC radio documentary about a young woman’s journey through the national inquiry process– losing a cousin to the Pickton farm and an aunty missing since 1976. That documentary will air on two national programs early February. Angela Sterritt is honoured to be speaking about racial inclusion and representation in the media at this event. Other speakers include Giller-prize winning author Joseph Boyden, Civil rights leader and personal friend of Martin Luther King Jr., Dr. Gerald Durley, and Very Reverend Stan McKay from Fisher River Cree Nation. July 2015 Powerful Keynote, Art Exhibition Launches Aboriginal History Week.